This Scandinavian-style wooden house is located in Bömighausen, just 10 km from the tourist resort of Willingen. After a day skiing or hiking in the High Sauerland, enjoy a glass of wine by the fireplace of this romantic wooden house. The 'Holzhaus', as the Germans say, is situated on a hill and has a magnificent view of the lush green surroundings. The nearest hiking trail is only 10 meters away, and in the winter you can cross-country ski here. In the nearby village you will find several nice restaurants, one even has a bowling alley. Further opportunities include: fishing, archery, bowling, fitness, golf, canoeing, climbing, horseback riding, flying, mountain biking, sauna, swimming, sailing, skiing, snowboarding, squash, surfing, diving, tennis, hiking, water-skiing and shopping! In short, everything you need for a pleasant stay in the beautiful Sauerland! 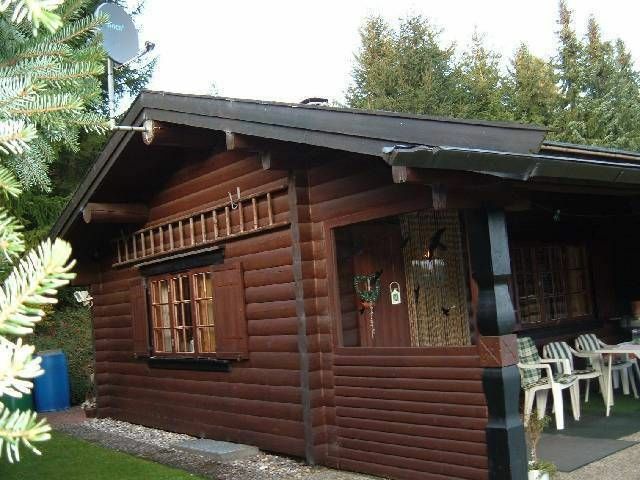 This well-maintained wooden house has an area of approximately 130m ² and can accommodate 2 to 8 persons. The spacious living room, which is also the kitchen, has a dining area and a sitting area with a fireplace, satellite TV with DVD player and a radio with CD player. The Internet is only available after you have signed a statement, that you will not download illegally (see conditions). You can use the WIFI for free in the cottage, please note that due to the location of the cottage the connection might not be good. The spacious kitchen is fully-equipped, including a ceramic cooker with combi-oven, blender, toaster, egg cooker, coffeemaker, kettle, fridge / freezer, dishwasher and washing machine. Of course there is plenty of cutlery, kitchenware, crockery, glassware and so on. Bedroom 1 and 2 have a double bed, the 3rd bedroom has two single beds and two trundle beds, these beds can be placed under the normal single beds. The bathroom has a sink, shower and toilet. The house has a staircase in the front, a covered terrace with furniture and a private parking lot. + Young persons (between 18 and 25 years of age) can only rent this bungalow if they pay a deposit of € 50.- per person. This has to be transferred - together with the amount of the rent - to Tour Operator. + If you wish to use the internet connection, you are obligated to sign a statement in which you take the responsibility to only download legally. All fines and costs due to illegal downloading come to your account. The High Sauerland, also known as "the land of a 1,000 mountains", with its high peaks, deep valleys, rivers, winding roads, flowing meadows, vast forests and cozy villages, is undoubtedly one of the finest, if not the most varied natural areas in Germany. For the hiker and mountain biker, there is a network of trails encompassing each level of ability. This network stretches hundreds of miles through a beautiful natural environment and offers splendid panoramic views. Bömighausen lies in the Neerdartal, between Willingen and the city of Korbach, and has about 360 inhabitants. A small nearby lake invites you in the summer to go sunbathing, swimming or fishing. A larger lake, called Diemelsee, is located 15km away.